Hello, Students of Lalit Narayan Mithila University Affiliated all college. Through this post going to update you about the Lalit Narayan Mithila University, Part 3 Examination Form Fill up. Students have to submit their exam form at their respective college. Students who are going to participate in the final year exam have to first submit their exam form first. Now Students can apply online also. Hope that you may search for LNMU Part 3 Exam Form Fill up, Exam form fills up where to fill, What is Mithila University part 3 Exam Form Fee, Last date to submit exam form of LNMU UG Part 3. First of all, I would like to update that the university is not accepting the online application form. Students have to submit exam form offline from their respective colleges. 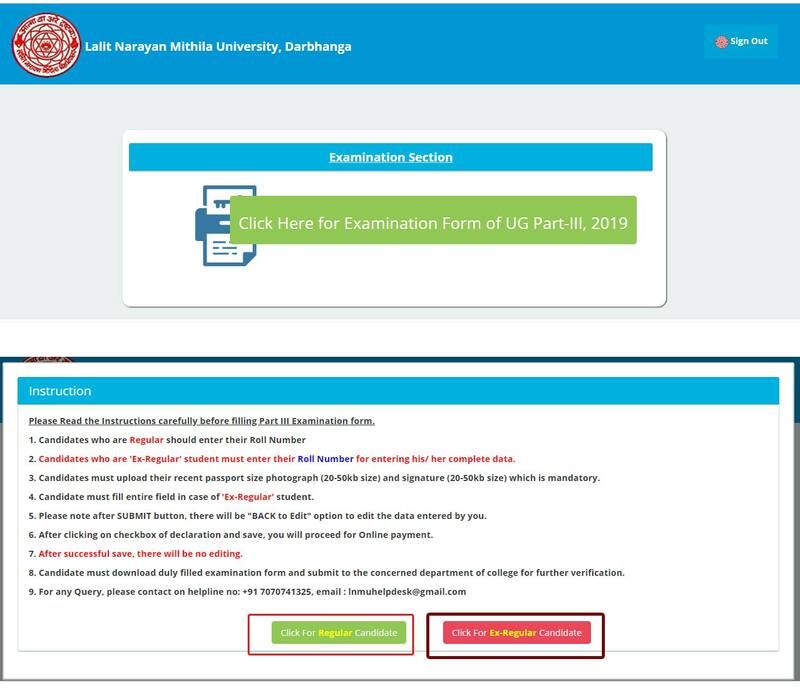 Students who have to appear in the exam can also apply online using user id and password, If students have already created the user id and password then they can use that or otherwise they can create new. Direct link to apply LNMU Part 3 Exam Form 2018, LNMU Mithila University Under Graduation part 3 Exam form apply. Apply online can be done through the go to an official website also. Enter user id and password (If available) or create. Then a dashboard will be open. All details will be shown then you need to provide then click on submit. After filling of online application form you need to submit it to your respective college. Lalit Narayan Mithila University is now accepting an application by the college. Students have to go with the following document, Part 1 Result, and part 2 Result photocopy and one photo with the exam fee. Examination Form of Final year lastly submits by 7th of December 2018. Students need to contact their college with above-mentioned documents to submitting exam forms. LN Mithila University has been extended the date for the application. The new date for extended as below given. Students have any query then they can ask through the comment, please note exam form of part 3 will be filled by part 1 & 2 passed students by university and online alos for all under graduation courses. University main campus me jaye aur part 1 and 2 ka marksheet jisme promoted hai aur registration phir aapka link waha se khol diya jayega. Aapke jaisa same case huya tha .. jisme 3 chakar lagana pad gaya. isliye aap form submit kigiyega to saath hi saath karwa ligiyega. thoda der 4 – 5 ghanta wait hi kyu n karna pade. Form submit hone ke baad payment ka link 24 ghante baad activate hoga phir aap print le kar college me jama kar de. Mai Jai Kumar Part1 part2 ka exam de diya hu but ,2 years padai chhor diye part 3 ka exam dena chhahta hu ….